Blowout Sale! 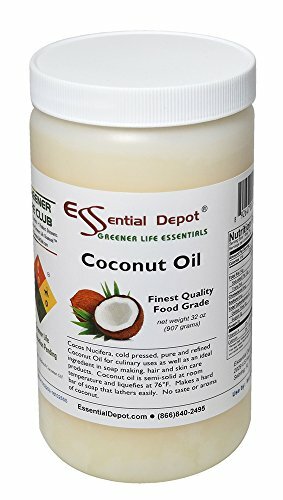 Save 56% on the Coconut Oil - 1 Quart - 32 oz. - Food Grade by Essential Depot at Smokey Robinson Foods. MPN: COCONUT-1-QUART. Hurry! Limited time offer. Offer valid only while supplies last. Coconut Oil Cocos nucifera Coconut oil is obtained from copra, the dried meat of coconut. Distillers separate the copra from the hull of the coconut. Coconut Oil Cocos nucifera Coconut oil is obtained from copra, the dried meat of coconut. Distillers separate the copra from the hull of the coconut. It is dried, crushed, and then expressed to remove the oil. This coconut becomes liquid at 76 degrees F; when cooler it is a creamy solid or semi-solid. Some people might call coconut oil, coconut butter but both are the same thing. This oil has a thick texture with no taste and no odor and is suitable for culinary uses as well as soap and skin care products. A percentage of coconut oil in cosmetics is moisturizing; too much of it can be drying. Its saturated nature resists rancidity and makes a very hard soap, while at the same time producing a fluffy lather. Soapmakers usually combine coconut oil with olive, palm, palm kernel or castor oils for an all-vegetable soap. Some soapmakers use between 20% and 30% of a soap batch as coconut oil.